Do you feel fit for work? Musculoskeletal conditions (problems with the muscles, bones, joints and associated tissues) are a major contributing factor to work place absenteeism. The Office for National Statistics reports that 30.8 million working days are lost each year due to musculoskeletal issues, such as back, neck and upper limb pain, in the UK alone. Habitual poor posture can contribute to daily aches and discomfort in the workplace and beyond. Whether you work at a desk or have a more manual occupation, your job may expose you to stresses and strains that can cause you pain. These can lead to various aches and pains, and other common musculoskeletal conditions such as sciatica, carpal tunnel syndrome and tennis elbow. Furthermore, workplace stress can increase the amount of pain you feel by causing muscle tension and spasms. Frequent short breaks away from the computer may help avoid back, neck and eye strain. Ensuring that your chair and computer display are appropriately adjusted so that the top of the screen is at eye level, may be more comfortable for your upper body and neck. When driving make sure you are positioned comfortably, and take regular breaks on long journeys, at least once every two hours. How can your osteopath help? Osteopaths are highly trained, healthcare professionals, experts in the musculoskeletal system (joints, muscles and associated tissues) and its relationship to other systems of the body. Osteopathic care is based on the individual needs of the patient and so varies depending on your age, fitness levels and diagnosis. Your osteopath can provide you with a fit note if you do need to take time off from work. You can discuss with your osteopath the impact work may have on your body and agree on an appropriate course of action that may help. Along with hands-on osteopathic treatment, your osteopath may also offer advice on posture, lifting and workplace ergonomics. If your work is office or computer based, you can spend a significant portion of your day seated at a desk which can lead to host of problems for your health. But with a few changes and addition of good habits, you can keep productive at work and keep healthy. Is your screen at eye level? If your monitor does not have height adjustment try elevating it with a riser, or even some old books! Keep your keyboard close. You should be able to sit up in your chair, have your elbows in an L-shape and still be able to reach your keyboard. If you are overstretching to reach it, you will need to adjust accordingly. Avoid crossing your legs. It can cause circulation problems and puts unnecessary strain through your lower back. If you are unsure about your desk or workstation set-up, ask your employers to provide a workstation assessment. 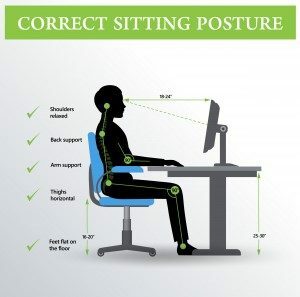 While you may start off in the correct position it can be very easy to drift into slouched position as your desk. Try putting a sticker on your monitor as a reminder to re-set your posture every time you see it. It is recommended that you should take a break from your desk every 30 minutes for at least one or two minutes. Try building in some of these good habits into your working day. Use a break to get a drink of water, which also helps you keep hydrated. Rather than phoning an office colleague, can you walk over to talk to them? When taking a call, can you take the opportunity to stand-up rather than sit? 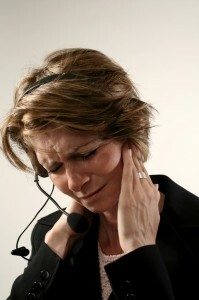 If your work involves making lots of calls, avoid tucking handsets between your neck and shoulder. Consider getting a headset so you are not battling with the handset, keeping your hands free and able to maintain a healthy posture. Increasingly we are working directly off laptops, particularly if you are a mobile or remote worker or hot-desking across offices. However the same rules apply, and even more so if you don’t have the luxury of an adjustable chair or monitor. If you are mainly working off a laptop you may want to consider getting wireless keyboards and/or risers, so you can optimise your work posture. Also consider where you work – your dining room table may be convenient but if of an incorrect height, extended working may cause shoulder, neck or back pain. If your work involves lifting or more physical activities, you need to be careful that you are not putting yourself at risk of injury or long-term health problems. One of the biggest causes of back injury at work is due to lifting incorrectly. Additionally, continuous repetitive activities, or staying in the same position for extended periods of time, can also lead to pain and discomfort. Being aware of how to move correctly when at work can keep you healthy for longer and keep you safe from injury. Before you lift any object, try to establish its weight and if you can indeed lift it safely. If in any doubt, don’t attempt it. Check your destination. Make sure you know where you are going to deposit your load and you have no obstructions in the way. Lift in stages. See if you can phase your lift. For example, from floor to table and then to destination. Once at the destination can you lift it in stages to its desired location? The golden rule of lifting – Bend at the knees and not your back! Remember do not bend forward from your back to lift an item. Before you start to lift make sure your footing is stable, keeping a wide stance. Get a good hold of the item and keep the item close to your body as you move up, using your legs to straighten up. Avoid twisting your back/body when lifting or positioning a load. Rotating jobs. If you’ve got several things to do, try and rotate from one activity to another after a shorter period of time, so you don’t get stuck in one position or activity. Keep a healthy lifestyle. With a physically demanding job it’s important to make sure you are eating healthily, and maintaining your body fit for work. Depending on your job, you may want to consider doing other physical activities for fun that will either build strength or your cardiovascular stamina. Off work and suffering back pain? Keep in regular contact with your employer to make them aware of your situation, and to discuss what adjustments might be needed once you are ready to return. If there is no occupational health provider available, your GP or safety representative may be able to discuss possible work restrictions or adjustments. Suggest any practical workplace adaptations or alterations which might help you to cope while you return to full time working. And of course, see your Osteopath! We offer appointments in Devizes, Pewsey and Amesbury – please call 01380 728453 for further information or book online.